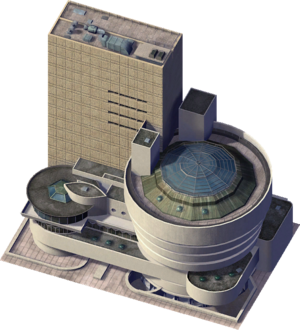 The Guggenheim Museum is a Landmark Building in SimCity 4. It is a recreation of the Solomon R. Guggenheim Museum in New York City, New York, United States of America, built in 1959 as it appeared in 2003. The reason why it is called The Guggenheim Museum and not Solomon R. Guggenheim Museum to avoid confusion with the other Guggenheim Museums (Deutsche Guggenheim in Berlin, Germany; the Peggy Guggenheim Collection in Venice, Italy; and most notably the Guggenheim Museum Bilbao in Bilbao, Spain) is not known.